The TrailHeads Reusable Water Bottle will keep you happy and hydrated! It holds up to 27 oz while remaining sleek and slender for easy use. The environmentally friendly bottle is made from 18/8 stainless steel and is BPA free, meaning you can drink worry free! The single wall construction makes the bottle lightweight and easily portable. Take it with you in a backpack pocket, slip it into your bike holder, or carry it with ease. With it’s beautiful topographical design this is a water bottle you’ll want to use again and again! Hand wash to clean. Do not leave in freezer. 27 OUNCE CAPACITY- Quench your thirst! This reusable water bottle holds up to 27 ounces of cold liquid! 18/8 STAINLESS STEEL- This single wall bottle is BPA free and environmentally friendly. It’s a water bottle you can feel good about using. LIGHTWEIGHT- The TrailHeads Reusable Water Bottle weighs in at 5.09 oz. With a height of 10.28” and diameter of 2.95” it is easily portable so you can stay hydrated wherever your day takes you. 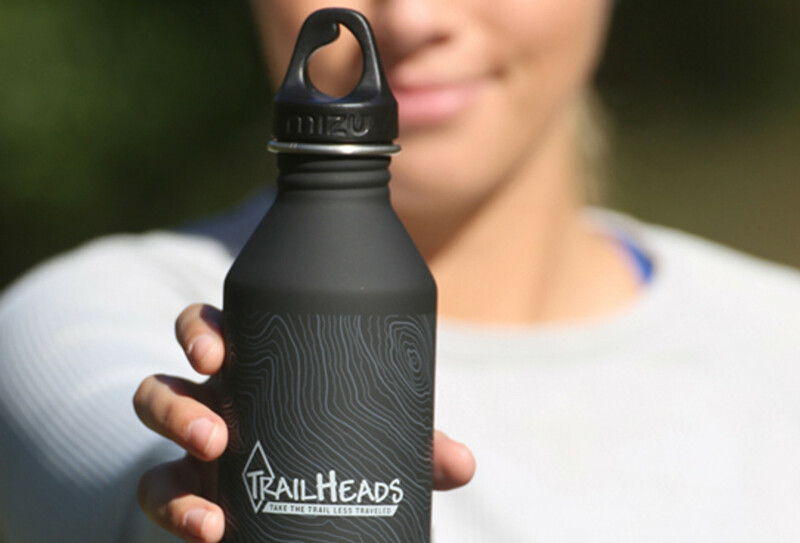 ATTRACTIVE DESIGN- The bottle looks incredible with an intricate, white, topographical map design and TrailHeads logo over a soft touch black finish.